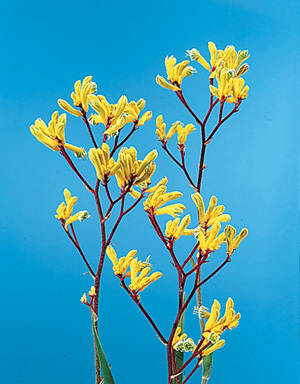 Home|Floral Library|Kangaroo-Paw – Anigozanthos spp., Macropidia spp. Decorative Life: From 8-25 days. The first 1 or 2 flowers per stem should be open. Cut stems at leaf 8 inches up from the ground. This species has been shown to be somewhat chilling sensitive. Therefore, it should be stored between 36-40F, wet or dry, up to 2 weeks. It is better if they are held for one week or less. Treat with a registered fungicide before storage so as to help control Botrytis. The scientific name is from the Greek words “anoigo” (to open) and “anthos” (flower), referring to the widely open flowers. Jones and Faragher (1991) determined that the following species and cultivars can only be stored a maximum of two weeks at 34F: A. pulcherrimus (a yellow flowered species) and A. spp. ‘Ruby Delight’, ‘Bush Harmony’, ‘Bush Haze’ and ‘Gold Fever’. From Lianne Moore: Using deep water will help flowers rehydrate more efficiently.